Is There Normal Blood Flora? E Kalfin. Is There Normal Blood Flora?. The Internet Journal of Microbiology. 2006 Volume 3 Number 1. Unknown microorganisms, which live as normal flora in every human's blood, were isolated in pure cultures and represented on microscope color microphotographs and electron microscope photographs in the blood of medical professors and associated professors. The aim of this article is to demonstrate 3 methods used as routine procedure in order to isolate normal blood flora in pure cultures. Indisputably, DNA-analyses are the most important discovery for microbiology (1, 2 ). The imperative condition that each newly discovered microorganism should pass over in silence unless DNA-analysis is not realized turns microbiology upside down, having in mind that tuberculosis, plague, cholera, etc. are found using only their isolation in pure cultures and not DNA-analyses. Pure cultures are the alpha and omega of microbiology in the past, present, and future because they allow a comprehensive study on newly discovered microorganisms, promoting their further DNA-analyses in every laboratory. BBL® Brain Heart Infusion with 0.25% sodium citrate, 20 mg/L gentamicin and 50 mg/L chloramphenicol, is distributed in sterile test tubes, 4.5 ml in each, and is sterilized in autoclave at 121°C, for 15 minutes. 0.5 ml venous human blood is inoculated in a tube and cultured for 30 days, at 37°C.After centrifugation 5 min/3000 rpm/, a Gram's stained slide and a subculture sample on sheep blood agar (as contamination control sample) are prepared. 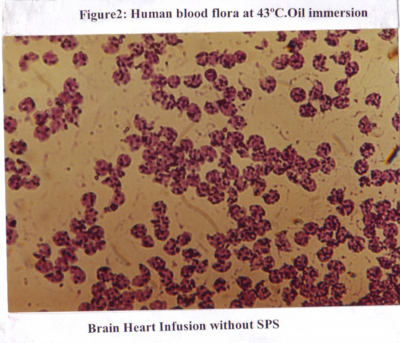 Brain Heart Infusion with 1.2% Noble agar is sterilized at 121°C for 15 min, cooled at 50°C, mixed with 10% outdated human blood for transfusion and poured in plates. Positive blood culture sediment is inoculated evenly on the surface. 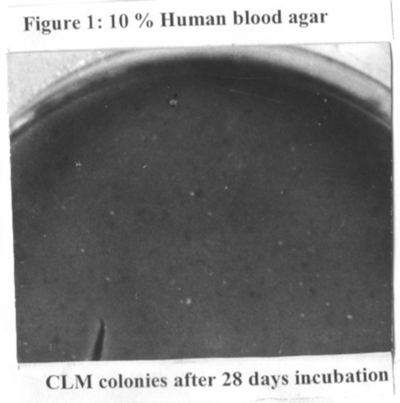 The inoculated tubes are cultured at 43°C for 14 days instead at 37°C for 30 days .and treated as described above. 0.2 ml blood from a BD Vacutainer® K2E 5.4 mg 3 ml should be taken and 0.4 ml sterile bidistilled water must be added. The mixture is swayed to help erythrocyte hemolysis. 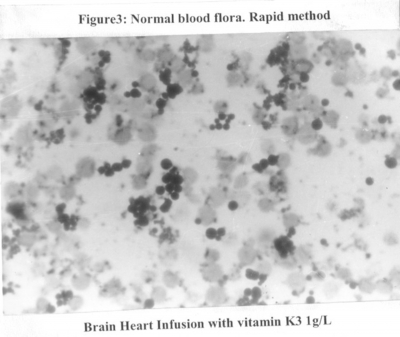 After 30 minutes stay at room temperature the hemolytic erythrocytes are cultured in a test tube with 2 ml Brain Heart Infusion BBL® which contains also 1 mg/ml vitamin K3, or vitamin K1 as growth factor, at 43°C, for 3 days and treated as describe above. Using this method color pictures and electron microscope pictures were demonstrated in another articles (3, 4). The microorganisms were observed as spherical bodies inside human erythrocytes, situated as in nests. These unique nests are specific for normal blood flora microorganisms. After 28 days, normal blood microorganisms formed tiny gray colonies, which were almost invisible with a naked eye. The colonies were scanty. They were spherical, soft and easily removable by a loop. At 43°C normal blood flora microorganisms are growing faster than at 37°C and the microorganisms can be seen inside the human erythrocytes as in nests after 14 days only. Only 0.2 ml human blood is necessary to isolate a pure culture of normal blood flora for 3 days, in every laboratory of the world, and therefore, hundreds of researchers to realize DNA-analyses of the unknown up to the present moment microorganisms. Thus they would finally start solving the problem of blood transfusion, containing donor's normal blood flora (5 ). Practically, the sterilization of the normal flora in transfused blood is impossible on a large scale at present and in near future. The human being is a hyper organism, comprising only10% human cells and 90% bacteria, viral, and fungal cells. (6) This fact makes adequate the hypothesis that transfusions should not require blood sterilization, but a similarity between donor's and recipient's blood. It is illogical for the human being to postulate sterility while the nature has created normal flora in blood. The consequences of the mixing of microorganism and their genetic materials in different individuals, as well as the significance of normal blood flora for medicine as a whole, go beyond the author's knowledge and the author is not going to discuss them.